The North American Handmade Bicycle Show (NAHBS), the world's largest consumer show for custom-built bicycles, will welcome an incredibly talented gathering of framebuilders and component manufacturers when it opens its doors on March 2 in San Jose, CA. With just a month to go before the show opens, exhibitors from all over the country and world are hastily finishing special projects and brand new frames to unveil at the show. "There is a level of excitement in our preparation for this show at Chris King Precision Components that we do not see for any other event during the year," says Chris DiStefano of Chris King. DiStefano reflects the sentiments of most NAHBS exhibitors when he says, "Don Walker's Handmade Bicycle Show is unique in its capture of our interest as bicycle enthusiasts well beyond the business interests we may have in exhibiting." Soulcraft Bicycles is proud to announce the new limited-edition Alma Pura, a fixed gear, lugged roadbike built by renowned builder Ross Shafer, founder of Salsa Cycles. "The Alma Pura, whose name means 'pure soul', is a bike born out of pure love for the sport of cycling and the craft of framebuilding," says Sean Walling, now in his eighth year as owner of Soulcraft Bicycles in Petaluma, CA. "Customers get a beautiful lugged bike made by a framebuilding legend, and Ross gets to concentrate on building frames." San Jose local Ahrens Bicycles will bring some new frame designs to the show, as well as frame building components that other builders can utilize. Its new frame concepts for 2007 include a single speed aluminum mountain frame with sliding dropouts and the "Vanderkitten Hardtail" developed with women-specific geometry and special color schemes. 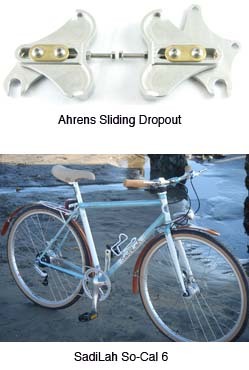 Consumers will also love Ahrens' new wisecracker bottle opener, a lightweight bottle opener that attaches to the seatpost, called "the best invention of beerkind" by its users. "We are very excited to showcase our current projects at the 2007 NAHBS next March in our own hometown," says Mike Ahrens. Those interested in tandem bicycles must stop and see Brent Ruegamer, who will have with him the world's lightest tandem and one that has won three gold medals in the US national championships. Having raced professionally for 17 years himself makes Arizona's Ruegamer an expert on different racing setups, and he has another specialty - bicycles for the size-challenged. "Being small myself I can really relate to special fit needs," he says. "I am able to use my insight to match exactly what they are looking for." Jon Kendziera of Wisconsin's Jonny Cycles will announce a new semi-custom track bike at NAHBS. Essentially a stock frame, the new track bike can be ordered with various options, allowing customers the opportunity to buy a first-class handmade frame at a fraction of the price, and in time for this year's track season! He is also excited to showcase his first frame constructed of the new Reynolds 953 super-strong stainless steel, which was just developed last year, as well as his new titanium quill stems. SadiLah Handmade Framesets will introduce a steel cyclocross frameset built with fillet brazed Columbus Neuron tubing mated to carbon seatstays and featuring a carbon fork. "This past year has been a great year for Sadilah," says builder Chuck Schlesinger. "I have been able to produce custom framesets that have fulfilled the desires and expectations of my clients. I look forward to another great year of building frames and making new friends." He has a few special projects to display at NAHBS, including the So-Cal 6 bicycle with disc brakes and 650B wheels built for Shimano's Alfine Challenge, a competition to find a concept bike for Shimano's new component group. As they prepare new frames, parts, paints, designs, decals, colors and special handmade flair to showcase at NAHBS, exhibitors are looking forward to meeting with attendees to find out what consumers are dreaming about. That's the NAHBS way: builders listening to consumers' fantasies and then planning products to match them. One NAHBS builder who won't second-guess you is Steve Garro of Coconino Cycles in Arizona, who says, "I think whatever bike you want is a cool bike." Consumers are invited to NAHBS to see their dreams realized.